Esther Lafferty is the wearer of many hats and many beautiful shoes, though not all at the same time. She also has a Masters Degree in Human Sciences from the University in Oxford and worked as a medical publisher before turning her hand to writing and event organisation, reviewing children’s literature as an invited reviewer for Amazon and working with cultural institutions across Oxfordshire as the organiser of Alice’s Day, an event paying homage to Lewis Carroll’s works. 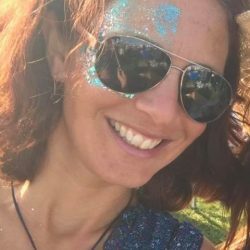 ​Esther specialises in marketing and PR, working with an artisan community of 1000 artists across Oxfordshire and beyond, and a number of other organisations and companies. ​In her role as Festival Director of Oxfordshire Artweeks, Esther organises the UK’s biggest and longest-established Open Studios Event, during which as many as 500 venues open their doors to host pop-up exhibitions each May, and for Christmas in November and December. She is also Festival Communications Officer for IF Oxford science and ideas festival. ​In her ‘wordsmith’ hat, Esther writes regular feature articles on the visual arts and Life for the Lifestyle magazine OX for whom she is the mermaid-in-residence; general and family features for Pick Family magazine (Oxfordshire); and occasional art, travel and business profile features for the Oxford Times, Oxford Mail and The Times of Malta, among others. She is also Experience Oxfordshire‘s Art Blogger and she has been a theatre reviewer for Theatreworld since 2010. This blog serves merely as a chronological record of many of these pieces. ​Although her feet are mostly in Oxfordshire, the Maltese island of Gozo has stolen her heart. You can follow her journey with the eclectic jottings in her blog Something Gozitan.